The name Joe Doucet might not ring any bells to most blues fans, but Doucet was a prominent part of bands led by Clifton Chenier and Freddie King before fading into obscurity in the ’70s. Recently, Doucet was “rediscovered” by a Houston writer, Roger Wood, during an interview with a resident musician. Doucet approached Wood and announced that he could play the guitar the writer was holding. Upon proving that he could play it, Wood steered Doucet to Eddie Stout, owner of Austin’s Dialtone Records, who soon had Doucet in the studio. Over the past decade, Stout has done his best to record Texas blues artists who might otherwise have never gotten the opportunity to record. Previously, Dialtone has issued outstanding releases from artists like Ervin Charles, Lil Joe Washington, Earl Gilliam, Matthew Robinson, and Barbara Lynn, along with efforts by the Texas Trumpets, the Texas East Side Kings, the Texas Southside Kings (featuring Big Walter Price), and the Texas Soul Sisters (which included Gloria Edwards and Lavelle White). Doucet’s recent release, Houston’s Third Ward Blues is a fine addition to Dialtone’s already impressive catalog. 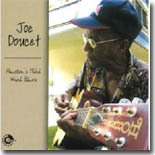 Doucet plays some spirited, stinging lead guitar and he sings in a raspy, edgy tenor, even singing in French for the zydeco classic, “Hey Leo.” The opener, “Got You On My Mind,“ is a slow blues, and the fiery, defiant “I Ain’t Going Down” features Earl Gilliam’s organ and Doucet’s wild, nearly screamed vocal. Other originals include “Recitation,” a soliloquy on lost love, and “Bird Without A Feather,” which is another slow blues. Doucet also covers a lot of familiar Texas/Louisiana tunes as well, ranging from the Cookie and the Cupcakes swamp pop standard, “Matilda,” Slim Harpo’s “Scratch My Back,” Frankie Lee Sims’ “Walking With Frankie,” and “Bad Luck,” which is actually an acoustic take on Lonesome Sundown’s “My Home Is A Prison.” Other less regional covers include Rosco Gordon’s “Just A Little Bit,” Little Johnny Taylor’s “If You Love Me Like You Say,” a solo acoustic “Rock Me Baby,“ and even “Back At the Chicken Shack,” a lively workout on the Jimmy Smith instrumental that features Gilliam’s organ once again. In addition to Gilliam, the backing band includes O. S. Grant on saxophone, Jackie Arceneaux on bass, and Jackie Gray on drums. They provide rock solid support and the production is strong as well, recalling some of those great old swampy classics from the ’50s and ’60s Gulf Coast region. If you are a fan of those recordings, Houston’s Third Ward Blues will fit nicely into your collection. Hats off to Dialtone for getting Joe Doucet into the studio. Hopefully, there will be more to come.